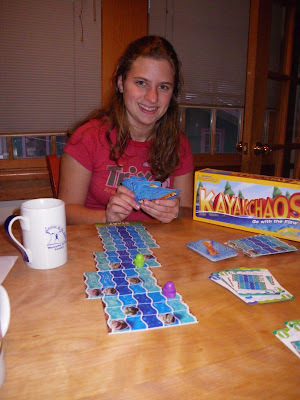 Kayak Chaos, an all-ages board game by SimplyFun, challenges players to move their pieces down a river they construct as they go with the help of a deck of direction cards. Along the way, players avoid rocks and delay each other by shifting and flipping portions of the river. Kayak Chaos costs $28 and can be purchased online from the SimplyFun website. Thanks to Steve and Brenda Adsmond of Freemont, MI for calling our attention to this fun game! 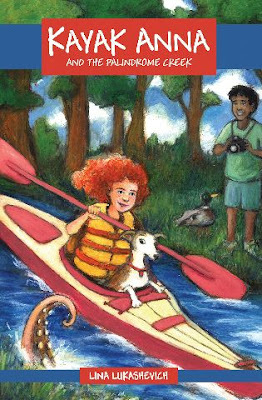 Kayak Anna and the Palindrome Creek by local author Lina Lukashevich revolves around an 11-year-old girl who buys a kayak at a garage sale (for the palindromic price of $18.81) and explores her local creek, discovering odd creatures, water pollution, environmental activism and friendship. Kayak Anna is available for $9.99 at KayakAnna.org. All profits benefit Living Water International, a Christian organization that helps people in impoverished communities create local solutions to their water problems. 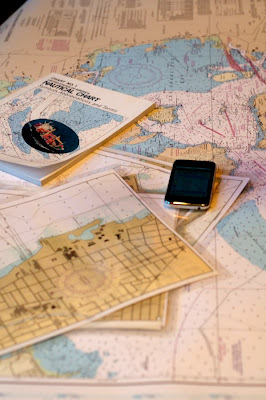 Option 1: Purchase a nautical chart to a destination your favorite paddler longs to go. Option 2: Buy Chart No. 1, the guide to nautical abbreviations and terms. Option 3: Buy the AyeTides ap (for paddlers with iPhones), which provides buoy data on tides and currents at thousands of locations around the globe. Option 4: Photocopy a portion of a chart and laminate it to create a waterproof deck chart. Include a grease pencil for taking notes on the chart. Option 5: (Best of all...) Treat your favorite paddler to all four! Remember GORP? 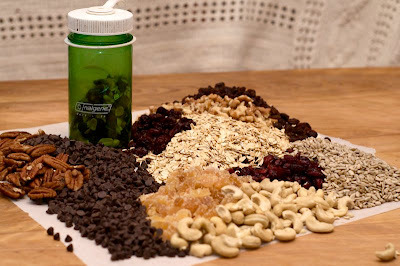 The acronym stands for Good Old Raisins and Peanuts, and the mix has sustained many a paddler over the years. Mix the ingredients together and put the mixture in a Nalgene bottle. 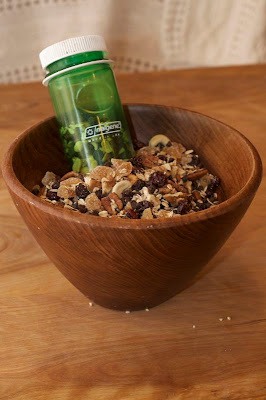 That way, your favorite paddler can tip the bottle into his or her mouth rather than handle the mix and get it wet. And your gift will help satisfy one of the essential elements of every paddler's kit: something healthy to fuel the journey. What's the next best thing to paddling? OK, the next best thing to paddling or watching paddling DVDs, but something you can do at the same time as either of those activities? Wearing paddling jewelry, of course! 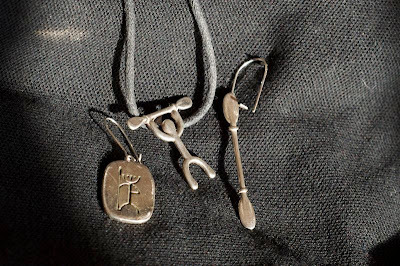 Ancient paddler earring, kayak paddler necklace, kayak paddle earring. Rik, who lives in northern Wisconsin, has been creating gold and silver jewelry on paddling and northwoods themes for 40 years. His necklaces and earrings (posts and wires) feature ancient and modern paddlers as well as canoes and kayaks, and canoe and kayak paddles. He also offers lava stone bookends with images of ancient paddlers. Necklaces range in price from $36 on a linen sports cord to $48 on a sterling silver box or snake chain, depending on the size and design of the pendant. Earrings are $38 to $58. Bookends are $80 each or $150 for a pair. Ho, ho, ho. Or is it tow, tow, tow? What do you buy for the paddler who has everything--or the paddler who only wants things that are out of your budget? For the next couple of weeks, we'll highlight some gift ideas in the low- to mid-price range, in no particular order, including some you can make yourself. 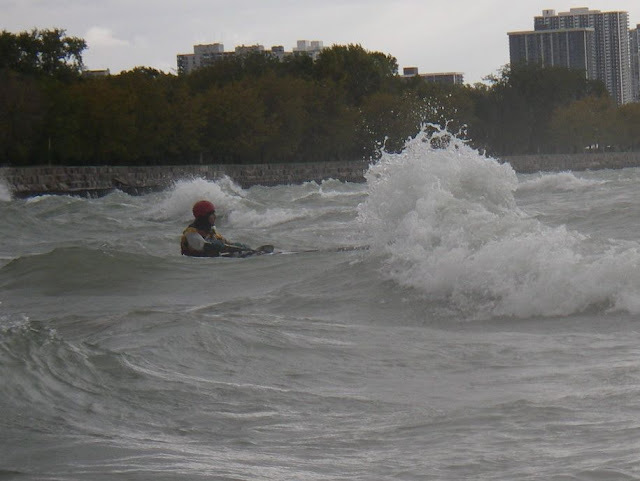 Here in the Chicago area, several pools are open to kayakers for instruction or just for practice. 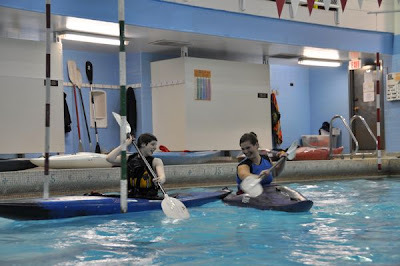 Some are offered by outfitters and offer options of instruction and kayak rental as well as open pool time; others are run by clubs or schools and offer peer mentoring. 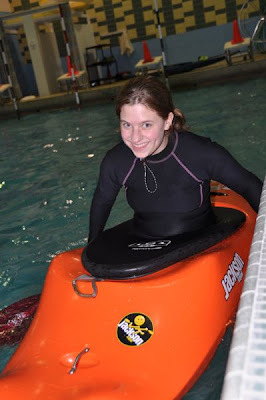 Either way, pool sessions enable kayakers to work on specific skills and keep themselves sharp during the long, cold winter when the lake is frozen over. Here are some of the pool sessions we're aware of in the Chicago area. If we've missed any, please post a comment letting us know. 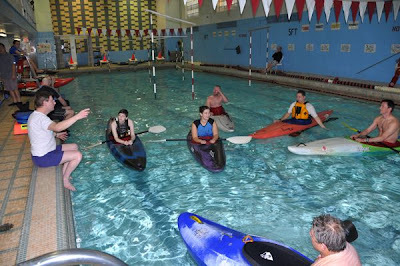 Geneva Kayak Center offers instruction and open pool sessions in West Chicago on Saturday afternoons. Buy a gift certificate here. 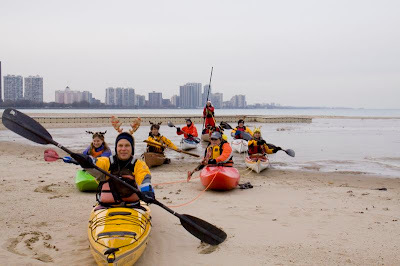 Kayak Chicago offers instruction and open pool session at UIC in Chicago on Wednesday evenings. Buy a gift certificate here. 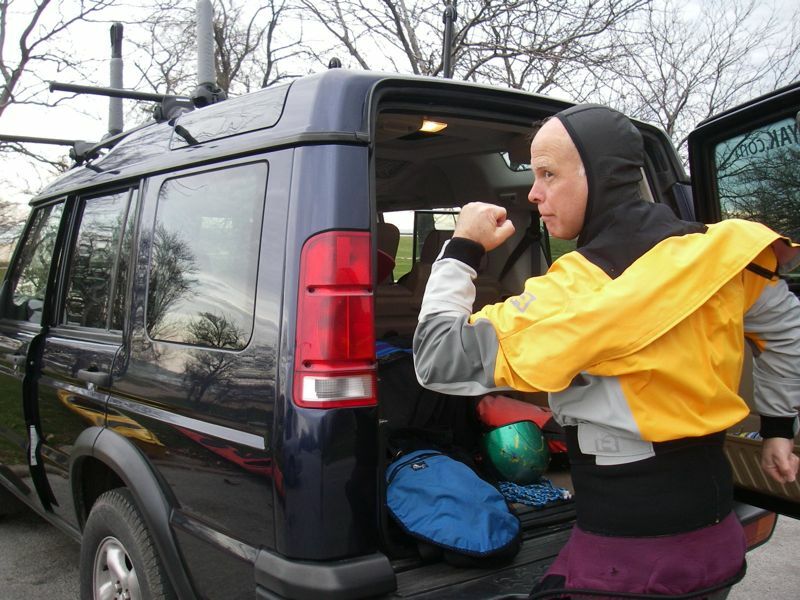 The Northwest Passage offers four-week rolling and rescue classes in Skokie. Information here. Naperville North High School offers open pool session on Sunday mornings. 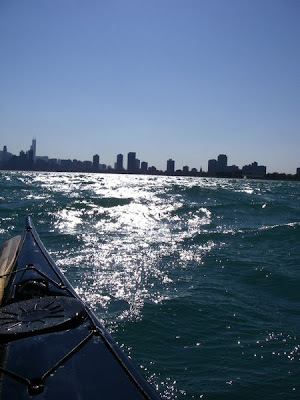 The Chicago Whitewater Association offers 10-week kayak instruction classes in Oak Park and Des Plaines. Winter sessions begin in January. On Friday, we found an "It's a bird; it's a plane; no...."-type situation in a store parking lot. 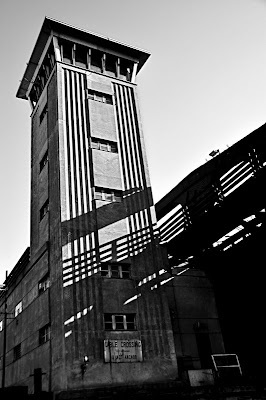 People were standing in the cold, looking up, pointing and muttering odd things about crop circles and alien invasions. We had no camera, but Alec was able to get this photo with his iPhone, which doesn't quite do justice to how dramatic it looked to the naked eye. After the phenomenon dissipated, we hurried home and pulled out our cloud books. 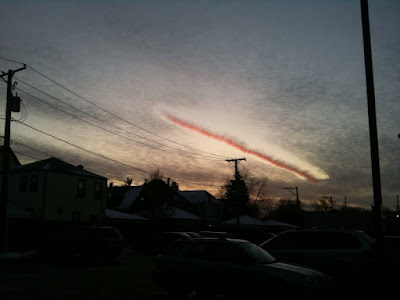 We found an image like this one in Richard Hamblyn's Extraordinary Clouds, which identified it as a fallstreak hole "created by the sudden freezing of an isolated patch of supercooled cloud, which falls away to leave a visible gap behind." The dramatic red lighting was due to the sunset. It's rare, in our urban environment, to find a group of strangers transfixed by a natural phenomenon. This fabulous cloud accomplished that, temporarily suspending the pressure to complete errands and get home. What a lovely way to end a work week. Here in Chicago, the Metropolitan Water Reclamation District is charged, in its own words, with "protecting our water environment." 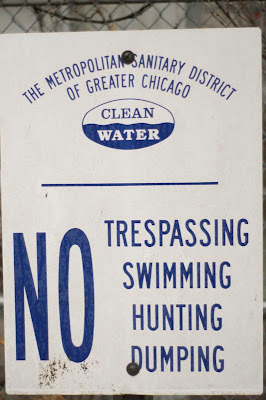 How reassuring, then, to find this sign on the north branch of the Chicago River. 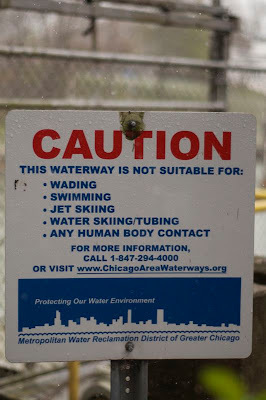 "This waterway not suitable for: wading, swimming, jet skiing, water skiing/tubing, any human body contact." Why is this river, which runs right through the heart of Chicago, so polluted? Because it's the recipient of 1.2 billion gallons of undisinfected sewage effluent from our city's wastewater treatment plants every day. The United States Clean Water Act and the Constitution of the State of Illinois both guarantee clean water. Two years ago, the Illinois Environmental Protection Agency called for disinfection as a part of the treatment of wastewater discharged into the Chicago River. Doing so would bring our city in line with the practices of other major US cities. But the MWRD is opposed to disinfection, claiming it would be too energy-intensive and too expensive. What's being dumped into the Chicago River? According to the Natural Resources Defense Council, sewage-contaminated water contains adenovirus, coxsackie A and B and hepatitis A viruses, echovirus, norovirus, rotavirus, salmonella, shigella, E. coli, campylobacter, vibrio, legionalla, mycobacterium, Giarda lamblia and cryptosporidium. These pathogens can cause respiratory illness, meningitis, encephalitis, infectious hepatitis, typhoid, cholera, Legionnaire’s disease and gastroenteritis. If this bothers you, contact the Illinois Pollution Control Board. Let them know how you use the river and why you would prefer the water to be clean enough for "human body contact." For more information, check out what the Friends of the Chicago River have written about this problem and how you can be a part of the solution. Marooned by a combination of a healing arm (Sharon) and a malingering cold (Alec), we haven't been able to paddle lately. That hasn't kept us from reading about the waves we're missing, however. 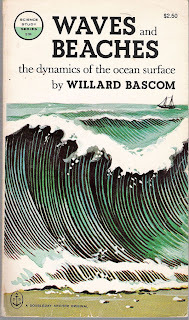 In fact, we're absorbed in two books by pioneering oceanographer Willard Bascom, who died in 2000 at the age of 83. Waves and Beaches: The Dynamics of the Ocean Surface was first published in 1964 as part of the Science Study Series of "up-to-date, authoritative, and readable science books" by the Physical Science Study Committee of Educational Services Incorporated. Bascom's scholarly surf credentials are extensive. He began his career as an oceanographic engineer in 1945, when he joined the World War II Waves Project of the University of California at Berkeley. 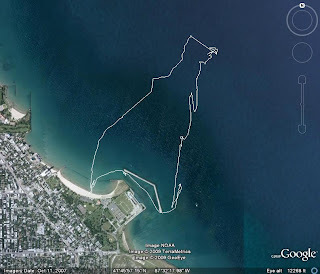 The initial goal of the project was to analyze the underwater shapes of beaches to understand how aerial images could help the military predict surf. Later, the project continued for scientific purposes. Bascom's day-to-day work involved going out in huge, breaking waves in a "dukw" (amphibious truck) and taking depth measurements with a lead weight on a line, then correlating those readings with wave heights measured by markers and transits. 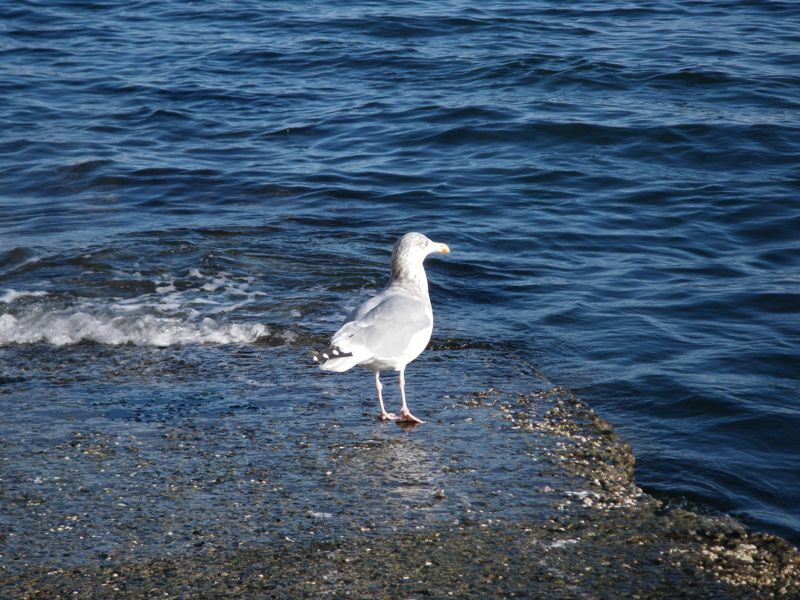 Bascom, who had previously worked in mines and tunnels, had never before seen the Pacific Ocean. "Somehow, in innocence and ignorance, I was persuaded that fifteen-foot breakers smashing down on a thirty-two-foot tin boat were nothing to be disturbed about," he writes. "In reality, of course, we underestimated the height and unexpectedly encountered breakers over twenty feet high." 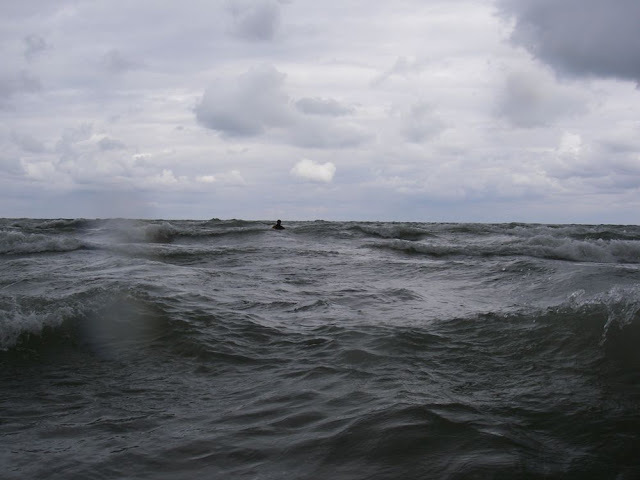 The local Coast Guard considered these conditions unsuitable for anything other than emergency rescues. "But they had the advantage of appreciating the risk," he notes dryly. His literal immersion in the science of surf was the start of a remarkable career in oceanography. He went on to direct the Mohole Project for the National Academy of Science and become president of Ocean Science and Engineering, Inc. And fortunately for us, he wrote this amazing book (among others). Waves and Beaches begins with chapters on wave theory and properties. He covers sea waves, storm waves, shallow-water waves and the longest waves of all: tides. In the process, he explains the physics of waves--why they break when they do, how their speed and force relate to their height and frequency--and how they are affected by shoreline and underwater features. If you don't get hung up on the complicated calculations and instead read his explanations, you'll find this book surprising accessible and, at times, surprising. Bascom disputes the existence of "undertow," for example (though he takes rip tides very seriously and explains why they occur and how to survive if you're caught in one). "As a wave crest moves into water whose depth is about twice the wave height....the crest 'peaks up.' That is, the rounded crest that is identified with swell is transformed into a higher, more pointed mass of water with steeper flanks. As the depth of the water continues to decrease, the circular orbits [of the water particles] are squeezed into a tilted ellipse and the orbital velocity at the crest increases with the increasing wave height....when not enough water is available in the shallow water ahead to fill in the crest and complete a symmetrical wave form, the top of the onrushing crest becomes unsupported and it collapses, falling in uncompleted orbits. The wave has broken; it is surf." Reading this book, it's hard to believe it was written more than 50 years ago. It feels remarkably contemporary, both in its science and in its spirit. Sadly, it is now out of print, but you can still get a copy online. It may seem insane to pay $20 or more for a book that says "$2.50" on the cover, but it's well worth it. We'll write about the other book, The Crest of the Wave: Adventures in Oceanography, Bascom's autobiography, in a future post. The stores opened early today for holiday shopping madness. The lake was open all night, so we didn't have to wait in line. And we had the place to ourselves! Alec wearing his festive Black Friday wool hat. The Skyway on display. No holiday discounts there. A skyscraper far from the Loop. So long and thanks for all the fish! Hannah and Lyn head home. 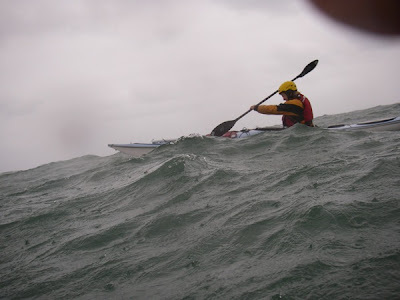 For those who question the safety of kayaking, we have evidence that staying at home can be far more dangerous. Yesterday, while carrying a bin of recyclables to the alley, Sharon had a close encounter of the sutcherable kind with the top of an aluminum can. 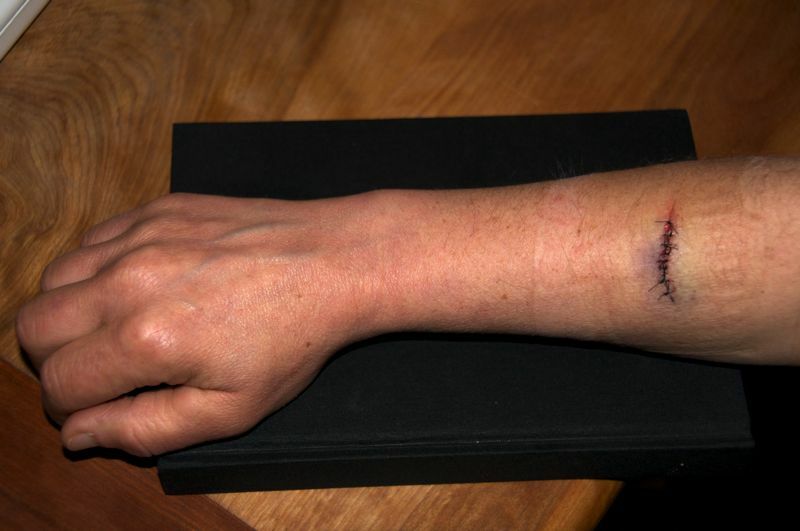 Sharon'a forearm, nine stitches later. Alec did get to put some of his Wilderness First Aid training to use. And since we were well within two hours of access to medical attention, he didn't have to sew Sharon up himself. Thanks to our fabulous family physician, Robin Uchitelle, Sharon is on the mend. But she won't be paddling for the next two weeks. Who says calm days can't be fun? 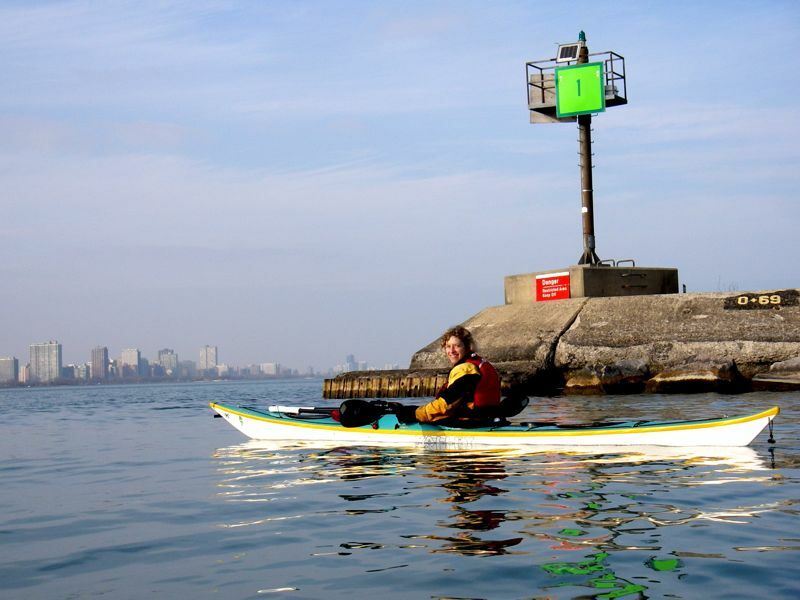 Sharon paddles along a breakwall east of Navy Pier. "You wouldn't want to go paddling today," a friend said in a message on our voice mail. "The wind is light and the water is flat." We missed her message because we were out on the lake. In fact, it was a lovely day. We could put in and take out anywhere we liked. We didn't even have to pay for parking at North Avenue Beach. We saw only two boats: a tour boat heading for dry dock and a Coast Guard boat zipping to shore. Most of the buoys were gone. First we visited the four-mile crib, one of the city's water intake locations. It's a fortress-like structure with a Tim Burtonesque tower on top. The water was calm enough that Alec was able to bring out his non-waterproof camera. Alec shooting the four-mile crib. From there, we paddled down to 12th Street Beach. No sunbathers, no lifeguards, no seagulls. Just groups of elementary school students on field trips to the Museum Campus, who found us at least as interesting as the marine mammals in the Shedd Aquarium. We rounded out our paddle by visitng various lights and lighthouses along the breakwall east of Navy Pier. Sharon gives some scale to the boulders at the base of the lighthouse. We paid our respects to light number 1. By the time we returned to North Avenue Beach, the sun was getting lower (even though it was barely 3 p.m.) and the air was starting to cool. We landed on the empty beach, packed up in the abandoned parking lot, and returned to the chaos of rush hour traffic--two water creatures in a current of landlubbers. Review: "Sea Kayak with Gordon Brown"
Gordon Brown, photographed by Simon Willis. 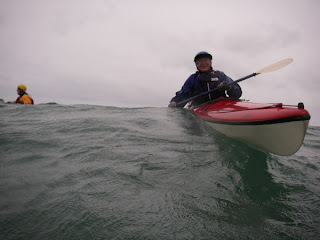 When Gordon Brown’s book, “Sea Kayak: A Manual for Intermediate and Advanced Sea Kayakers," came out in December 2006, it was one of the few books not aimed at beginners. 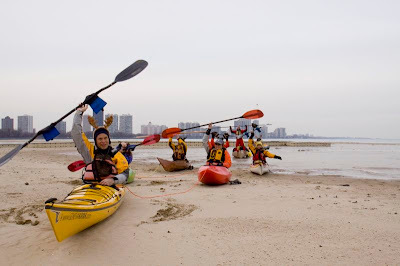 It was a survey of all the knowledge required of sea kayakers, infused with his personal points of view. 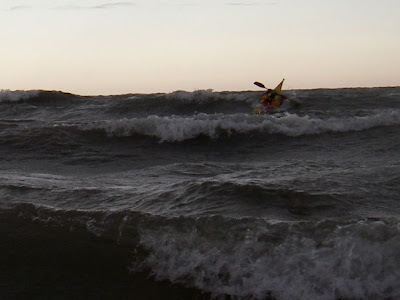 Some of those same idiosyncratic perspectives are in Simon Willis’ new video, “Sea Kayak with Gordon Brown,” produced by Sunart Media and distributed in North America by Heliconia Press. 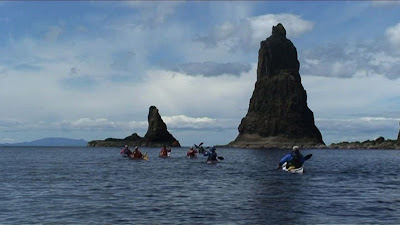 This video uses a four-day journey along the west coast of the Scottish Isle of Skye as a frame for coaching sessions on sea kayak strokes. Gordon Brown’s companions include his wife, Morag, and five paddlers who range from beginner to low intermediate, along with the invisible cameraman and his “driver” who paddles from the back of his double. Gordon Brown and companions paddling along the west coast of the Isle of Skye. Gordon Brown covers familiar basic strokes (forward stroke, forward and reverse sweep strokes, draw strokes) as well as more advanced maneuvers (bow rudder, cross-bow rudder, stern rudder), in both calm and rough water. His demonstration of linked turning and draw strokes while rock gardening is gorgeous. And his explanations are often unlike ones we’ve heard before. For example, he describes the forward sweep as a high brace position stroke and the reverse sweep as a low brace position stroke. He also suggests exercises for gaining comfort with some of the strokes, such as a beautiful demonstration of practicing eddyline turns with eyes closed. Each of the coaching sessions contains such a gem and makes this video well worth watching no matter what your paddling level. Gordon Brown, making rock gardening look easy. Beginners will find that this video won’t answer all their questions. For example, he explains edging and leaning without clarifying their roles in turning. We agree with his comment toward the end that the book is an ideal companion to the video. In fact, we feel that the book is stronger as a stand-alone source of information, while this video is an appealing sampler. 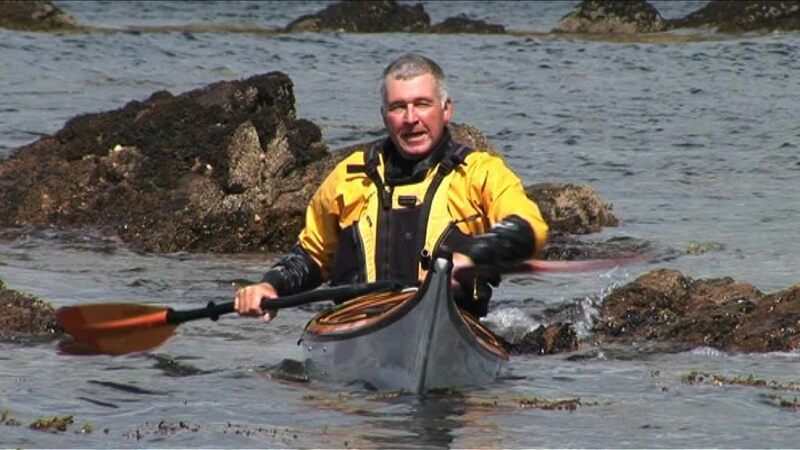 But every paddler will get something practical out of this video, in addition to an abiding affection for Gordon Brown, whose charm and sense of humor are palpable. After listening to him sing in the sea caves, you may be tempted to run out and buy a ticket to Scotland. 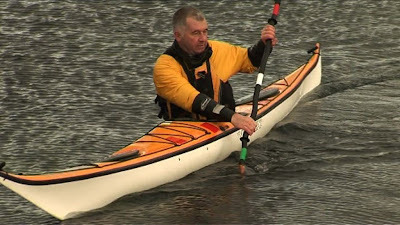 Sea Kayak with Gordon Brown - Main Trailer from Simon Willis on Vimeo. The DVD is available now directly from Sunart, and will soon be carried at Geneva Kayak Center and other well-stocked paddle centers. Today was National Cape Day, according to our son. Or perhaps it was. 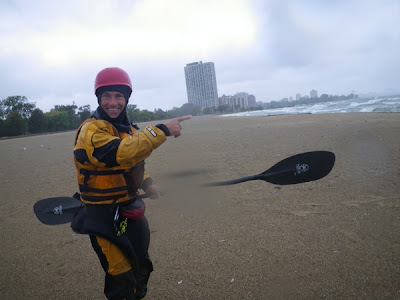 Regardless, Alec took the morning off to paddle with Scott in what promised to be conditions demanding near super powers, if not capes. Not all superheroes wear capes. 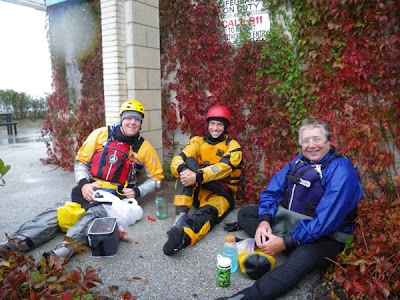 Some wear drysuits. Scott models. 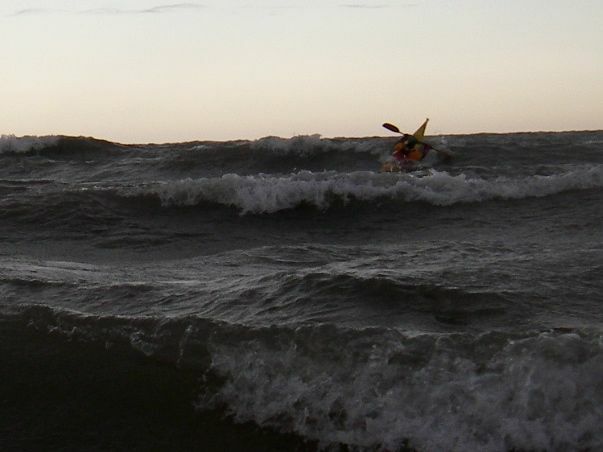 The winds were out of the east-northeast at 25 knots, gusting to 28, and the waves were 5 to 7 feet and gnarly. An unusual current flowed from south to north along the beach at Montrose, perhaps the recirculating portion of the general north-to-south flow. Scott punching out or surfing backwards...hard to tell which (and who remembers?). Conditions like these can wear you out quickly. 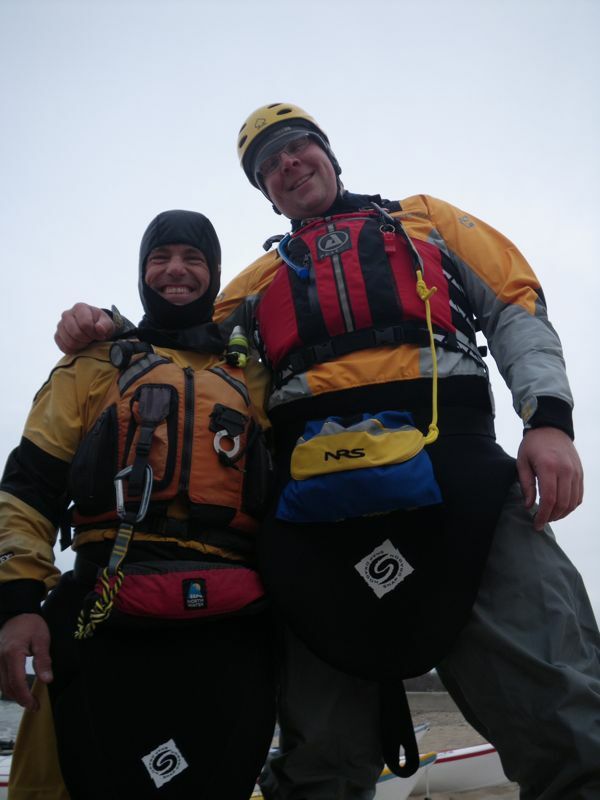 Before calling it quits, Alec and Scott paddled out to the end of the pier and looked south, where the full brunt of the wind was bouncing off the pier and the breakwall. There was clapatis as far as the eye could see. 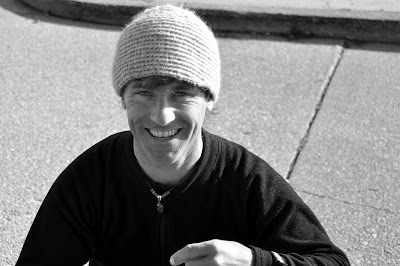 "If you paddled out there, you'd be on your own," Scott mused. Scott explores the clapatis south of the pier. 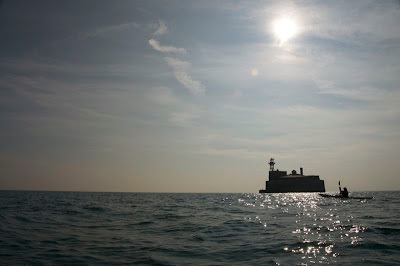 Conditions can kick up quickly on the Great Lakes and subside just as fast. By tomorrow night, the winds will shift around to the southeast and the waves will subside to 1 to 3 feet. Even superheroes can't do anything about that. Wave height matters. Paddler height, not so much. 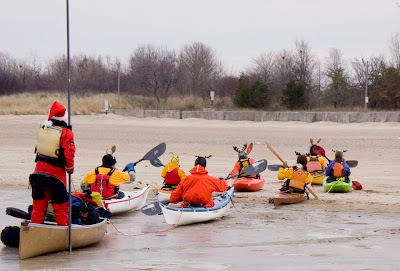 Yesterday, Geneva Kayak Center held an end-of-season staff meeting. 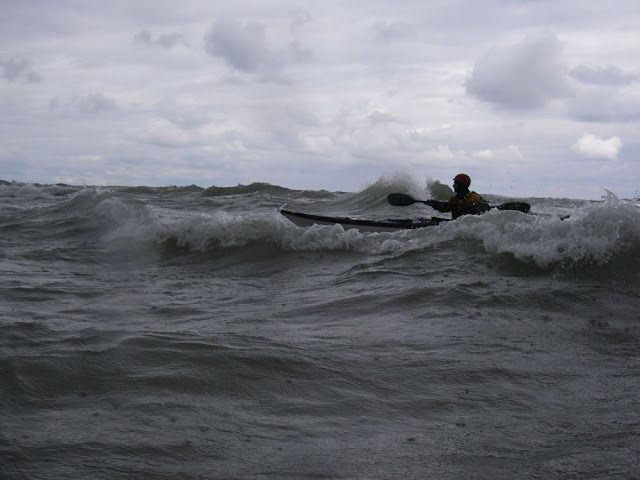 Part one was held on Lake Michigan in the company of three- to five-foot waves, 20-knot winds and plenty of geese. Needless to say, it was the nonverbal portion of the meeting. Part two was held while hungrily awaiting pizza delivery. to take maximum advantage of the waves. 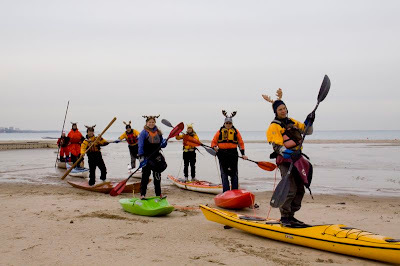 Some of us haven't paddled together since the start-of-season staff paddle and meeting. 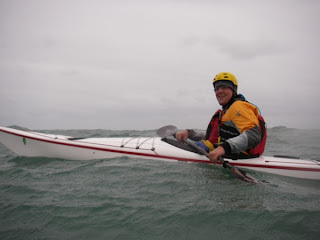 We've led parallel paddling and teaching lives, coming and going at different times with different students. We hear about one another's on-water time more often than we share it. So this was an opportunity to get out and play together. 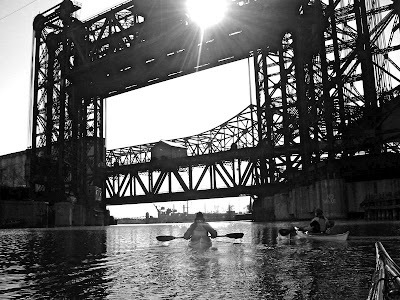 The paddling season is far from over. For this group, a "small craft advisory" is a warning that it's time to drop everything and get on the water. It's also a guarantee that we and the kite boarders will have the lake to ourselves. No sailboats, motorboats or tour boats. Just us and the birds. The start of the Chicago Whitewater Association pool sessions is bittersweet. It's great to see our river-running friends again, but it's a sure sign that winter is coming. John Karsh offers some bank-based coaching. This is the 30th year of the CWA's pool sessions here in Oak Park. 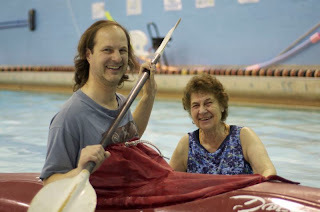 We offer two 10-week sessions, during which we cover strokes, rolling, river-reading and safety. In the spring, students will be able to join us for a series of incrementally more challenging river trips. Who says paddling in a pool can't be fun? For us, the CWA pool classes are an example of giving back to the sport that's done so much for us. This is where we first learned to paddle and roll. Now we can help other people gain both skill and a love of the sport. And who can argue with 78-degree water in the middle of winter? After yet another unseasonably cold and rainy weekend, many boaters called it quits. 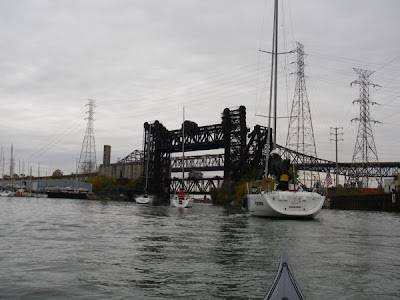 Yesterday, sailboats and tour boats streamed into the Calumet River en route to their dry docks. We figured we'd follow them. 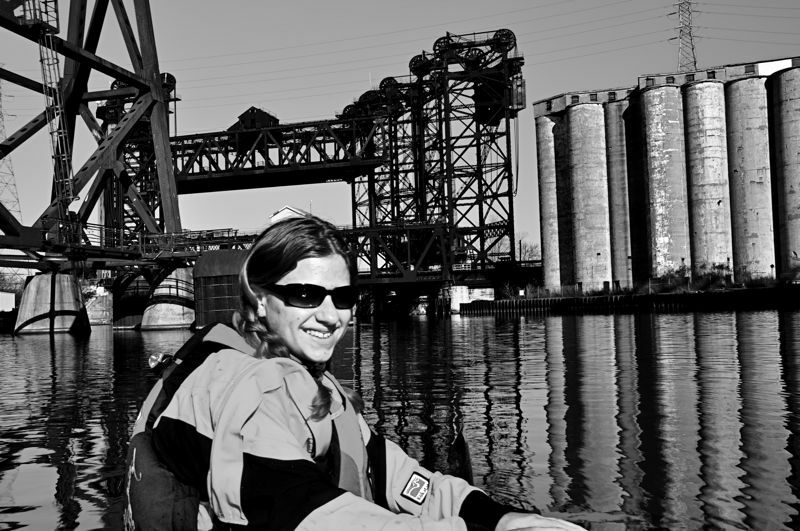 If you ever want to feel really small, try paddling in the Calumet River. 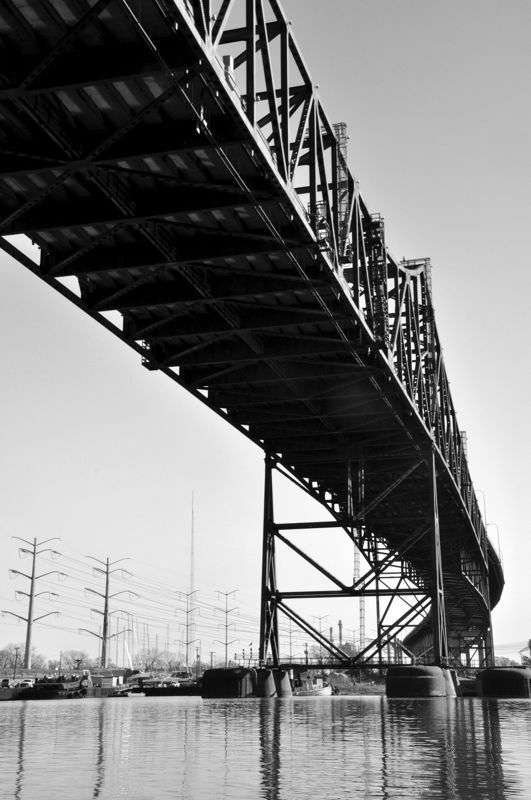 Nearly everything there is on an enormous scale: piles of coke, stacks of aluminum ingots, mountains of salt, mammoth ocean-going ships, towering cranes, groaning bridges...it's almost overwhelming. 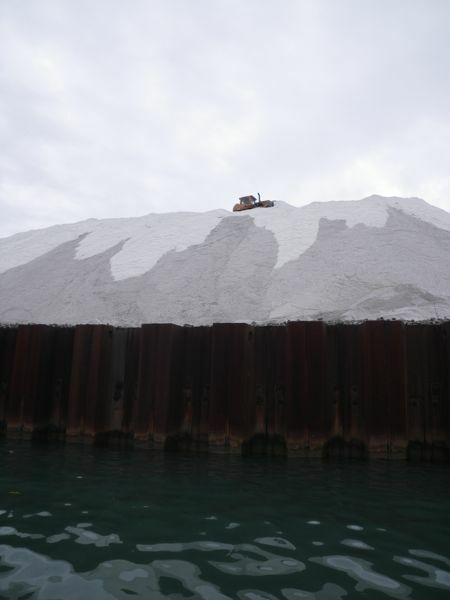 A tractor atop a mountain of salt. Our VHF radios enabled us to listen in on the conversations between captains and bridge tenders. We watched as the railroad bridge near the Skyway lifted up to let some boats go by, then lowered to allow an Amtrak train to cross. 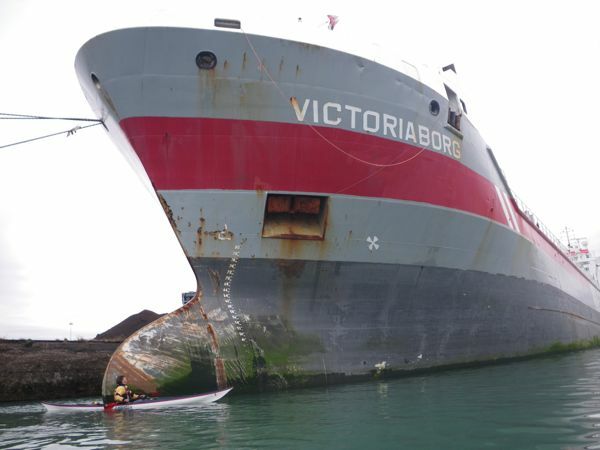 We paddled next to tug boats and ore boats and enormous ocean-going ships. Alec provides a sense of scale. This ship was headed to Duluth and then to Spain. 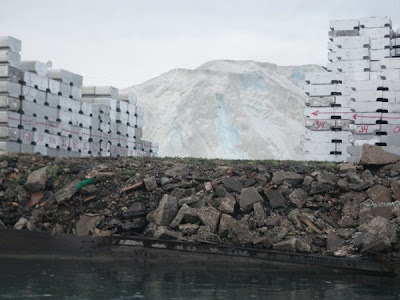 Stacks of aluminum ingots with a pile of salt in the background. There's something timeless about the Calumet River. If industry had emerged on Earth before nature, this would be a primordial land. 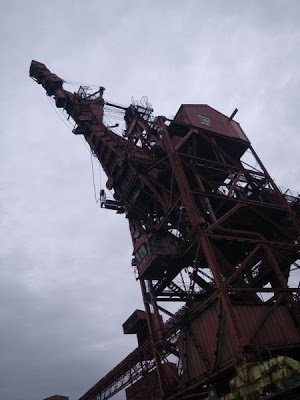 A relic of the days when giant machines roamed the Earth. 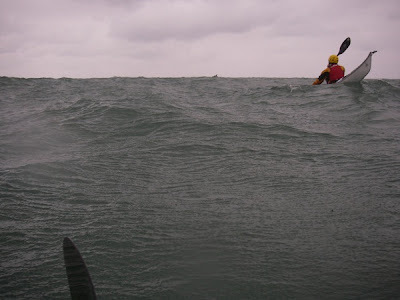 When we were newer paddlers, our estimates of wave height and wind speed were quite unreliable. We simply didn't have enough experience to provide a frame of reference. These days, we get a kick out of seeing how our estimates compare with hard data. Yesterday, we paddled out from the Wilson "launch ramps" (now the Mondog doggie beach) to the Montrose crib against quartering winds. 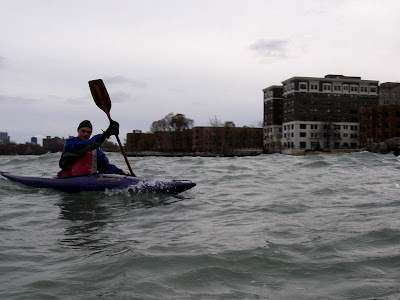 Then we paddled directly into those winds back to Fullerton Avenue. We estimated that the winds were about 22 knots gusting to something like 28. Sure enough, when we checked the data from the Harrison crib, the wind speeds at around 12:30 were 11.7 meters/second (23 knots) gusting to 13.9 meters/second (27 knots). Because the wind was off-shore, the water was flat near the beaches. Three miles out, the waves were perhaps 2 to 3 feet. Best of all, the sky was blue for one of the first times all month. Here's a short video of Alec launching into the surf against a 28-knot headwind. "Let's paddle!" Alec is ready to go. Friday arrived with 25-plus-knot winds out of the north, steady rain and 5- to 7-foot waves. 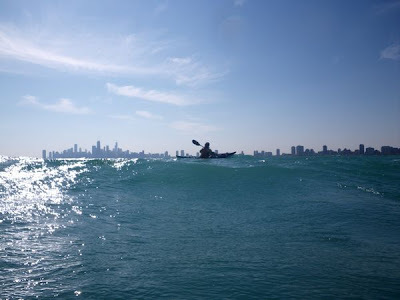 We met at Rainbow Beach on Chicago's South Side, still intending to paddle down to the channel. We assessed the waves from the beach, where they didn't look too intimidating, and launched into the surf and the wind. 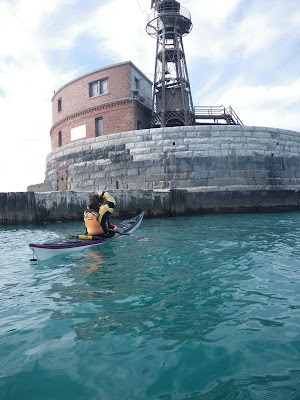 The unrelenting waves and wind made progress difficult and communication nearly impossible, so we fought our way through the breaking waves and tucked in behind the water filtration plant breakwall to assess our options. This was no day for inland paddling, we decided. This was a day to be out on the lake. 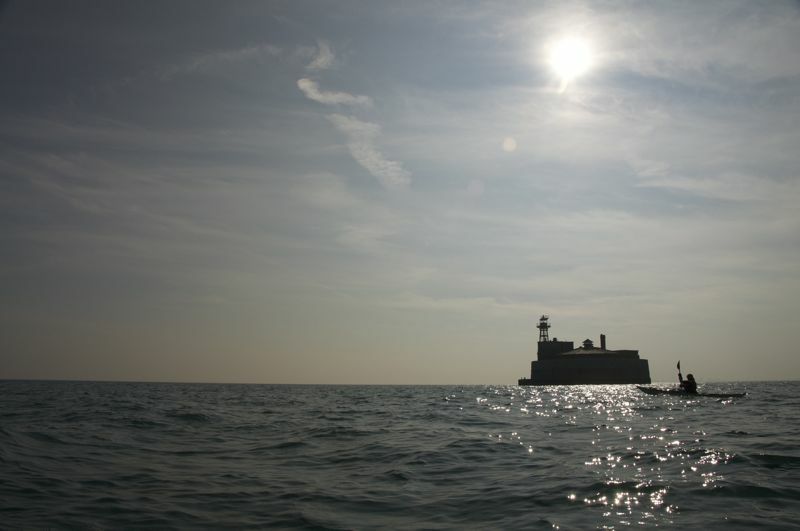 We decided to head out to the water intake crib--a crossing that would take less than 45 minutes on a calm day. The rain pelted our faces and the wind howled in our ears. The waves were steep and came in quick succession. Erik enjoying the bumpy ride (above) and Aaron at ease in rough seas (below). It was a slog, but a fun challenge. 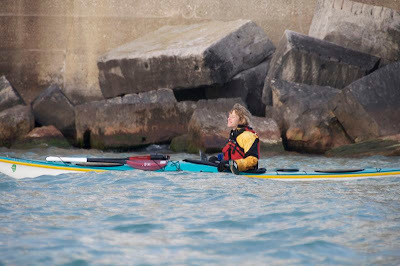 As we paddled out, I (Sharon) thought about Paul Redzimski and Mike Agostinelli's ill-fated Lake Michigan crossing in 2006. They found themselves in conditions a little bit gnarlier than these when they were just three miles from their destination on this side of the lake and had to be rescued--but they had to deal with those conditions in the dark, with colder water, after 47 miles of paddling, and with one boat taking on water. And it occurred to me: That was exactly three years ago. The rain pelted our faces as we padded into the wind. After 90 minutes, we still hadn't reached the crib. The rain hadn't stopped. The wind was intensifying. The waves were building. But perhaps most importantly, we were getting hungry. That might have been more of an excuse than a reason, but we decided to begin the return trip. Up and over. 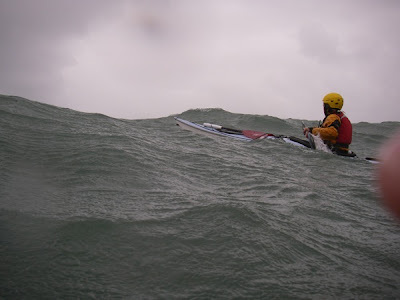 When you see photos like these, don't forget that somebody had to stop paddling to take them. Thanks, Alec. We flew back to the beach, dragged the boats onto the shore and hid behind the beach house to eat some lunch. We looked over to see that the water flowing down toa ledge from a puddle in the parking lot was being propelled back up by the wind. When we lifted our boats onto our racks, they nearly blew back down. This was a wind that commanded respect. Aaron, Alec and Erik enjoying a well-earned lunch. We decided to let the wind do its thing in peace. As we drove away, we appreciated the simple things in life: the heating in the car, the tea in our thermoses, and the luxury of being able to go out on an otherwise miserable day and have a great time on the water.